Any and all of the additions to coding will be put in here by the technician. Yugioh News and Academy Related Information will be posted in this section. MDA's User Guide is located here. It outlines everything that any current or new member will need to know about the academy. All new members MUST post here to introduce themselves to the rest of the academy. Got a Suggestion or Question about the academy? Can either be to improve, fix, or even try something new. Post here and see if your idea will be considered among the MDA Staff. All Ban Appeals will be held in this section. MDA's Main Shop. Check it out to see all the amazing items we have for sale. MDA's most creative section. Wanna learn, ask for a piece, or just browse other member's artwork? This is where all the colorful magic happens. Have any cool decks that you really want to sell to the rest of the academy? You can even sell to make any deck requested by the buyer here. Discussion of any YGO Card will be handled in this section. Having problems with a certain deck? Make a Topic here and ask away! Any and all YGO related questions will be handled in this document. This can range from how to play the game, how mechanics work, to even how to play a certain archetype. 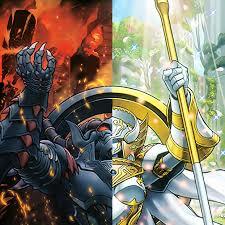 Wanna vs against your fellow academy duelist? This is the best place to do that and win MP in the process. Wager your own MP and duel against another duelist of the academy and see who takes all the gold....Or maybe even your soul! All Tournament related events, rules, and news will be discussed in this section. Any question on a current or later tournament? PM Thestalos The Monarch and he will get back with you as soon as possible. This is a place where anyone can read the amazing Monarchic Rp stories of the Rp owners and help them in their breathtaking adventure! All miscellaneous or non-academy related discussion will be located in this section. Enjoy our wonderful dice games and earn MP!